NFL free agency is now essentially a week old, and teams around the league have revealed what their strategies were. While some additional minor moves are likely to be made, now feels like an appropriate time to take a look around the rest of the NFC East and grade each teams' free agency period. On Monday we started with the 3-13 Giants. Tuesday we looked at the third place Washington Redskins. Today we'll zero in on the Dallas Cowboys. In his first three seasons in the NFL, Lawrence had 9 sacks. In a contract season in 2017, he broke out in a big way, collecting 14.5 sacks, earning second-team All-Pro honors. 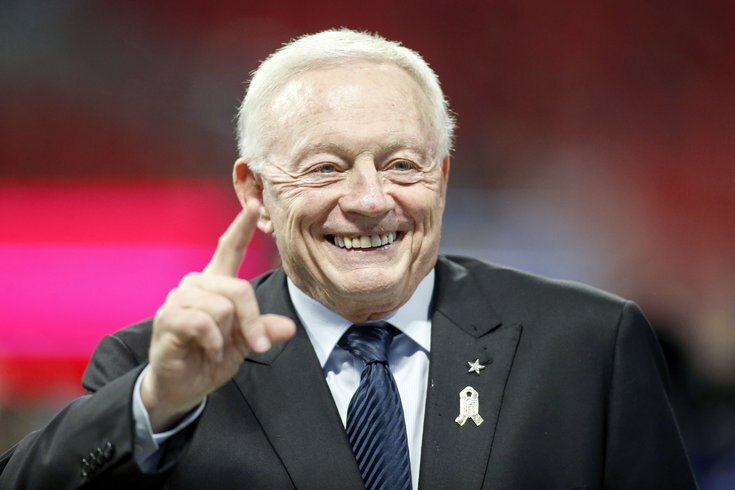 And so, the Cowboys slapped him with the franchise tag, as Lawrence will cost $17,143,000 on the Cowboys's cap this season, or 9.7 percent of their total available cap. Lawrence is a great player, but that is a huge rock in the jar. Bryant isn't that good anymore, and he's going to count for $16,500,000 against the cap in 2018. 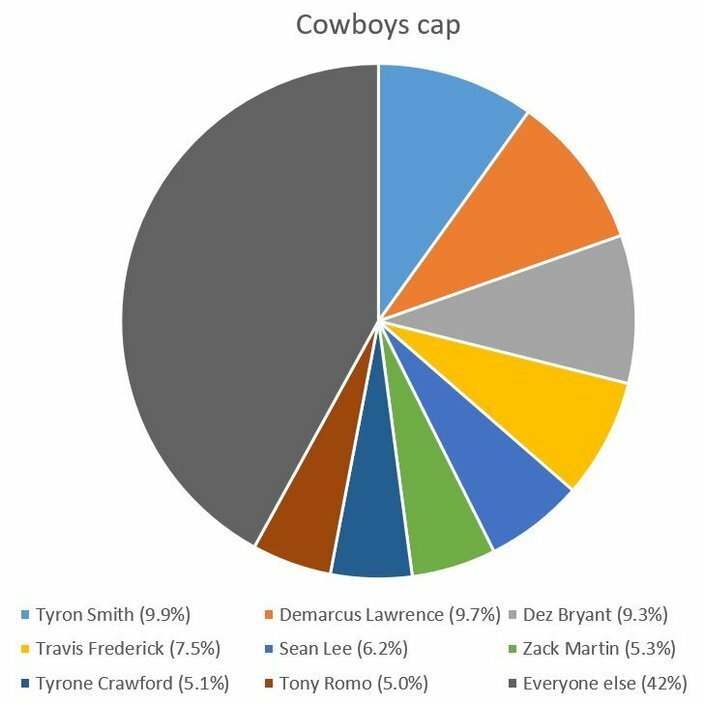 That's 8.7 percent of the Cowboys' cap. While he is still the Cowboys' best receiver, that isn't saying much. Over the last three seasons, Bryant has averaged 50 catches for 678 yards and 6 TDs. He has a total of 150 catches on 300 targets over the last three seasons, for a completion percentage of 50 percent when balls come his way. When Cowboys quarterbacks have thrown in another direction over that same span, they have completed 67.9 percent of their passes. The fear of "losing their best receiver" is keeping Bryant on the roster. That's crazy to me. How much of a pay cut is Bryant going to be willing to take? For a player who is as delusional about his own abilities as Bryant is, if anything, it won't be much. Cut him and move on. For years and years, the Cowboys restructured Romo's contract, putting off cap hits into future years, and it has caught up with them. Year No. 2 into retirement, Romo will still count for $8.9 million in dead money, or 5.0 percent of their cap. Demarcus Lawrence is a great player, as noted above, but having to use the franchise tag (and thus almost 10 percent of your available cap space) on a guy with one great season is less than ideal. The Cowboys are just living with Bryant's bad contract, for now. Travis Frederick is a very good center, but is he (or any center, really) worth 7.5 percent of any team's cap? In my view, hell no. Sean Lee can't stay healthy, and he's eating up 6.2 percent of the cap. Tyrone Crawford (16.5 sacks in five seasons) clearly has a terrible contract. Romo still counting for anything, much less five percent of the cap, is obviously a mess. Just to provide a contrast, on the Eagles' roster, Fletcher Cox counts for 10.1 percent of the Eagles' cap, Brandon Brooks 6.3 percent, Jason Peters 6.0 percent, and Malcolm Jenkins 5.7 percent. All of those players are worth their pay, and nobody else is over 5 percent. The Cowboys had to be sick when they saw the money the Jacksonville Jaguars paid OG Andrew Norwell, who received a ridiculous five-year contract worth $66.5 million, or $13.3 million APY. Zack Martin, a much better player who is in his contract year, is almost certainly going to be looking for more than that. Meanwhile, young and talented DE David Irving will play out 2018 on a second round tender as a restricted free agent, and then he'll hit the open market, while S Byron Jones will cost significantly more than he does currently when the Cowboys likely exercise his fifth year option or sign him to a lucrative extension next offseason. And then there's Prescott, of course, who will be eligible for a contract extension after this season. And Zeke Elliott. Think those will be cheap? All of that is a huge problem, considering the Cowboys are currently just $2 million under the cap, according to the NFLPA's daily salary cap accounting, as of Wednesday morning. The Cowboys have signed, um, their long snapper? They also traded for a fullback. Meanwhile, they've lost LB Anthony Hitchens, CB Orlando Scandrick, FB Keith Smith, LB Kyle Wilber, DE Benson Mayowa, and others. While Hitchens is the only loss that will sting, the Cowboys' depth will be further depleted, a recurring side effect of a top-heavy salary cap strategy. They'll get some 2019 comp picks, though. So at least there's that. Let's get something straight. The Cowboys haven't been inactive in free agency because they don't like what they see. They're inactive because they have to be as a result of years of cap mismanagement. The Cowboys have not improved in any way whatsoever during this free agency period. They've gotten worse.